Below you can read The Window Wizard Customer Reviews dating back to 2009. You can also read our reviews written on Google. The Window Wizard offers a local Double Glazing Repair Service, specialising in Window and Door Locks, UPVC Repairs in and around the Bexleyheath area. From a small job such as a damaged window handle to a door lock broken, call The Window Wizard now for a FREE quotation. We are a UPVC lock specialist and carry most of the Multi-point locking mechanisms for your doors. Therefore we can replace your broken door lock in one visit. Hi David, thanks so much for fixing the window, its made a huge difference already! We received outstanding service from The Window Wizard. We had been troubled by a leaking conservatory door for months which was gradually getting worse and worse and nothing worked to solve the problem. One visit from David and the leaking stopped completely. He truly is a wizard! Very happy with the service I got from David, would recommend to anyone. He arrived quickly and did the job in no time, and did not overcharge. I can’t recommend David enough. A problem locking my conservatory door had occured after very hot weather. I called Window Wizard in the morning & David advised that it was probably due to misalignment. He quoted a very reasonable price and attended the same afternoon and fixed the problem. He also kindly adjusted one of the windows that was difficult to close. If you ever need an honest, professional and courteous tradesman David is the man to call. Initial contact was via WhatsApp. Photos asked for & questions answered quickly and concisely. Fees upfront and no hidden extras. David arrived promptly, smartly dressed and extremely polite. First impression : PROFESSIONAL! After an initial inspection and the job looking a little more complicated than originally thought he got down to fixing the problem. He didn’t do this until my approval had been given. I would think the job took slightly longer than originally anticipated but the price was the same. Overall I would not hesitate to recommend THE WINDOW WIZARD. Thanks to them I feel secure in my home again! Many thanks Dave for repairing my broken window hinges. Great service and I shall recommend you to my friends. I rang on Wednesday, you attended on Friday, gave a fair price all with a very pleasant and friendly service. Job done. Many thanks. This is the second time I have needed Dave’s service, and once again the work was carried out efficiently and the price exactly as quoted when I initially contacted him. Very professional, knowledgeable and a nice bloke too. Thank you very much David for fixing all those broken window hinges.You provide an excellent service and i will recommend you to other people. Just wanted to thank you for fixing our broken bedroom windows. Both John and I are really grateful to finally have them fixed. Once again, thanks very much for the excellent service. I called Dave in the morning and he diagnosed what he thought was wrong with my baatheroom window and gave me a price to fic it. He said he carried most parts. He arrived in the afternoon, and the problem was as he had diagnosed.. a ‘broken gearbox’ the window was fixed within the hour, and the cost was exactly what he said. A real craftsman and a nice guy as well. I have no hesitation in recomending him and his busienss card is in a prominant position on our fridge. Thanks Dave. I broke the handle on the kitchen window , so we looked on line found the window wizard , he came round and fixed it , very good service, polite and helpful and good value, many many thanks , also thanks for adjusting the window tensioner aswell !! Dave provided an amazing service. Another company had already looked at the window and advised the lock was badly broken and we would need a new one. However Dave fixed it quickly without the need for any new parts. He came out the same day and also offered advice about upkeep and maintenance to help the windows last longer. I would definitely recommend his service and use it again if we have any other problems. Dave diagnosed the problem with a ‘stuck’ window over the phone and gave a fair quote for the job. When he arrived the problem was not as bad as first thought and Dave reduced the price ( not many tradesmen would do this). He efficiently made the repair and gave helpful advice. I believe him to be a very competent, honest person and would have no hesitation on using his services again, and I will definitely be recommending him to family and friends. Dave was very helpful and informative on the phone. Despite the torrential rain, arrived on time and completed fitting my door handle. The doors have always been a problem and we have had a few people out to try and fix them but just made matters worse. Dave advised me that they could still be rescued rather than replacing them. More work to be done. I would highly recommend Dave. Dave was helpful and knowledgeable on the phone, arrived on time, was polite and friendly and completed the job quickly. Will definitely use him again. Excellent service. Two windows and a door fixed very quickly. David was recommended to me and I would definitely recommend him on to friends and family. A fair price for the service too. From my initial contact, David was polite and friendly, offering possible causes for the failure of my window and corresponding prices. No nasty shocks when he promptly arrived to undertake the work, which he completed tidily and efficiently. I’d be happy to recommend his service. Dave responded quickly to adjust an external door that could not be secured. He was pleasant and informative, and he fixed the door within 30 mins. I would definitely use him again. Excellent job completed by David. Knowledgeable, quick and professional. Will definitely keep David’s business card for future work. Thank you. Great job. So quick and efficient. We don’t need new windows, just got David to properly repair the ones we have. No more draughts and whistling windows. A very fast, efficient and professional service. Nothing is too much for David – he answers all your questions and puts your mind at ease straight away. Excellent service. Have used Window Wizzard for 3 jobs and would highly recommend them. Very reasonable price and very reliable and consistently turns up on time. Would highly recommend to anybody. Thanks Dave again. 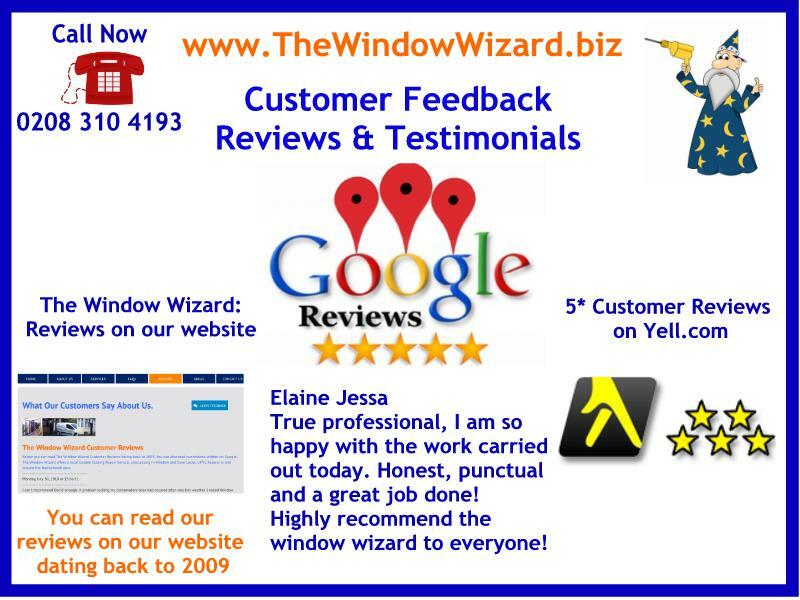 I have used the window wizard on a couple of occasions and found him to be absolutely excellent, reliable and honest. He offers a very cost effective and quality solution to almost all window repairs. Would highly recommend. David was really very helpful and did a very good job on what are quite old windows but he also provided sound advice. He is a very nice person, turned up on time and was really good. He certainly does not push you into getting more work done other than what is necessary. I would certainly recommend him to anyone and am more than happy to ask him for help again in the future. Brilliant – I cannot recommend Dave the Window Wizard highly enough. Dave is a true rarity a tradesman that takes pride in doing a good job and at an honest and fair price for his customers. I had accepted a quote over the ‘phone for some repairs to a couple of faulty windows; Dave arrived on time & on the date we had agreed, he completed a quick inspection of what I thought had needed to be done without fuss & assured me that the work that I had asked to be done was too much and actually there was a simpler and cheaper solution. Dave then proceeded to fix all of my faulty windows at a cheaper price for me – Brilliant. David has just come and done a great job repairing some of our windows in our flat in Greenwich. Very friendly and highly professional. I particularly appreciated his straight up honesty and would not hesitate to recommend his services to others. Found David the Window Wizard on the internet. My porch door fitted some years ago by Trade Windows was in desperate need of adjusting as it was not shutting properly and some of my windows were getting harder and harder to close. Emailed the Window Wizard who came out within a couple of days. Gave me a price up front so no nasty surprises and fixed my porch and windows which are now as good as new. Good to know David is there if I have any future problems and would definitely recommend his service. Thanks David. I am glad to say David was true professional arrived on time as previously agreed. David gave an honest assessment of the problem with my window and he went to complete the task with ease. From the short time he spent at my place I gathered David is an experienced professional who comes accross as a people’s person. I would recommend the window wizard to anyone without a shadow of doubt. Excellent service and on time. They diagnosed and resolved the problem with our door very quickly and I am very pleased with the result. Looking forward to a warmer winter at home. I would highly recommend this service. Very quick and efficient replacement of bottom panel in back door at a reasonable price. Friendly and reliable service. Highly recommended. I found David by chance and am so pleased that I did! He worked tirelessly to fix a front door that had several issues, and through sheer perseverance solved all the problems and saved me from buying a new door. I was thrilled and very grateful. I would recommend him any time. Very good service. When I called Mr Wizard was fully booked but he managed to make some time to come and realign my door as I was stranded. Thank you Window Wizard aka David!!! Excellent service. Prompt and efficient. Made excellent repairs on front porch lock. Would recommend any time. Thank you, David. Dave repaired the locking mechanism and replaced the handle on my bathroom. Excellent job and a very nice man to boot. Highly recommended. So nice to have a genuine person to repair something. I found this service by searching the internet. I read the feed back, which is one of the main reasons for choosing the window wizard. Well Dave turned out to be a really nice fella (as everyone has previously wrote), and I had a great conversation with him while he worked.He replaced 4 hinges on my aluminium windows without any problems, and even mended my front door (swollen in all this rain) at no extra cost. I would definitely recommend this company to anyone. Dave came round to fix the lock on our front door which had broken. He did all that very quickly, but also noticed the door was slightly mis-aligned. So Dave also re-aligned the door, and tightened all the locking screws which holds the door up! I then asked Dave to quote us on a window handle which we thought was broken. On looking at it, he said it wasn’t broken, just very dry. Dave took a photo to see what was going on (as it isn’t easily accessible) and then oiled it, fixing the handle there and then for no extra charge. Brilliant, fast, and reliable service. Will definitely recommend! I called Dave at 9.oclock and he had some jobs on but was here at 11-45, did a good job on my bathroom window lock, that a well know window company (who installed the windows) could not fix properly. Would recommend Dave to anyone,very nice pleasant man. Dave was incredibly helpful, provided us with advice and guidance, and although resolve the issue helped us to get in touch with people that could. We would thoroughly recommend him in the future. Dave called on time and fixed the problems with my daughters front and back door charging the exact price quoted. He is a real craftsman with a true pride in his work. The first time Dave did work for me he proved to be knowledgeable, reliable, honest and decent. 3 years later I contacted him for another job and he’s just the same. Highly recommended. Second time using this company. This very pleasant gentleman came in, there’s no messing about, he did the job, gave some advice and finished. The price quoted was the price i paid and the advice was free. Strongly recommend this company. 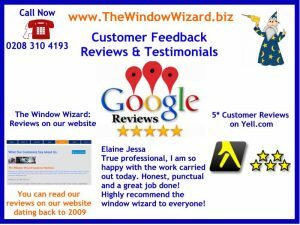 Fantastic service, very polite on the phone when I called to find out if the window wizard could help solve my problems. He was on time and the price he quoted me on the phone was the price I paid. Would not hesitate to use this service again and will definitely recommend to friends and family. Made an enquiry this morning, and spoke with secretary, she told me he would ring me at lunchtime. Which he did. Appointment made for this afternoon. Dave turned up and fixed my upvc front door. Most impressed. Still waiting for other companies to call me back. An impressive service. Many thanks. So glad that I have found this company and would not hesitate to use Dave again. He quoted £60 to fix our door, and indeed he did fixed it for £60. Dave is a very friendly, and trustworthy gentleman. Highly recommend. Cheers. What a refreshing change to have a tradesman go the extra mile to help a customer. Dave quoted me over the phone for repairs on 3 windows. He did an excellent job including unexpected extra work that arose during the repairs without any extra charge. I would certainly use Dave again should the necessity arise and would highly recommend him to any future customer. Don’t bother looking at any other companies! Dave is polite, punctual and very skilled. He managed to repair the door when it looked like it would need a new locking system. He quoted £60 over the phone which is exactly what I paid. Would highly recommend him. Was very glad we had chosen David / Window Wizard as he was very friendly, very efficient and got a very tricky job done. Would thoroughly recommend him. Very good service – window hinges replaced quickly and efficiently and price as quoted. Would recommend to anyone. Swiftly sorted out jammed windows, replacing locking mechanisms and handle, efficiently, no mess and to quoted price. Professional and friendly service, would call on Dave again without hesitation. Thanks for an excellent job. Much appreciated. What a fantastic service. A double glazing company was not helpful in repairing a broken door hinge and was only really interested in selling a new product. Dave was completely reliable and honest -a pleasure to do business with. Would not hesitate to recommend! My window had jammed and would not open. I contacted Dave who came the following day. I thought his initial charge was over-priced, however on observing the meticulous and pains-taking manner in which he dissembled the window and replaced the broken lock, his fee became too small. Dave went the extra mile to adjust all loosen parts of the window. I also had my back-door catching in the lock. Dave replaced the loosed bolts charging me next to nothing on what could have cost me over 300 pounds. Thank you Dave, l will recommend you anytime or day. Quick, efficient, friendly and punctual: a great service. My conservatory door handle broke, and the door was shut in the locked position, and could not be opened and I would have to get a new set of doors at a cost of £2,000! This is what I was told by a locksmith, after he had charged me £76.13, for ‘trying’ to open the door, but not actually achieving anything. Luckily, I was given The Window Wizard’s card, and Dave came the next day, and opened the door! His cost was as quoted, £50, and he left the door in a usable and secure position, so that we could get out into the garden. He has got the new lock, and will be fitting it shortly. I found Dave to be efficient, honest and helpful. I would certainly reccommend him in the future. Dave carried out work for me on realignment of my front door, so that my front door is now fully flushed. I thought that Dave was a really professional tradesman, excellent pricing for the work that was carried out. I would recommend Dave to all my family and friends, and for any future work. I can highly recommend Dave. He fixed both our front and back doors approx a year ago, and we had no hesitation in calling him back when the back door jammed recently (due to a seperate problem). Dave is punctual, friendly, does a great job, and all for the fixed price quoted on the phone before he arrives. He’s also great at problem solving and tries to fix things rather than having to pay out for new parts. Highly recommended, I would have no hesitation is calling Dave again. Thanks. Thank you very much David for fixing my wimdow. I was very impressed with the prompt service, clear price and honesty. I have kept your card for the future and will be recommending you to anyone who may need your services. Kept me informed with what needed to be done and fixed the problem with the french doors quickly. A very good service I would highly recommend the Window Wizard. I have been folding up paper and stuffing it in the gaps in my windows every winter, as I remember my mum doing 30 years ago! This couldn’t be right, I thought, not with double glazing. Then along came The Window Wizard! My windows are now paper-free!!! He did a brilliant job. Well done. After putting up with a squeaky door for the past 5 years I click on the link for The Window Wizard and all I can say is that it’s the best £50.00 i’ve spent in ages! Friendly, reliable and informative service with the added bonus of a years guarantee! Thanks Dave. I will definately be recommending you! Dave, Thank you so much your your speedy service on our lettings properties. I would highly recommend you to anyone needing your service. company to my friends. Well done! only option. I really can’t recommend highly enough. are still genuine people out there and restores my faith in humanity. Our back door needed attention but it was not until we needed a Dog Flap fitted that we found The Window Wizard and Dave. What a great job he did with both the door and flap, prompt service and very friendly manner. Will recommend to everyone. Dave kept in regular contact in relation to the ordered door funiture. As arranged Dave arrived spot on 11am to start the work. Like all jobs it was not as simple as expected, but Dave managed to sort everything out and my front door now looks like new. Thank you. just wanted to say that the window wiz is a genius! he fixed my back door perfectly! I called Dave out to sort out a dropped door and he soon spotted and corrected a nasty botched job and security risk caused by a ‘locksmith’ that we used last year. Thanks for such a friendly, informative and professional service. I would recommend The Window Wizard to anyone. I was going to buy new windows, but now they all work great. Excellent company – will definitely use again – top work – thank you! Excellent service all round. Friendly, reliable, work carried out faultlessly. Highly recommended. A upvc door had been a recurrent and irritating problem ever since it was installed. Although the original installers returned many times to make adjustments the door never closed properly and on several occasions jammed completely.This was finally sorted out by the Window Wizard! David was prompt, friendly and efficient but above all was honest, competent and professional.I recommend the Window wizard without hesitation. I have lived at this property for the last 6 years and have always had problems with my porch doors sticking and now they will not close properly or lock. I called the Window Wizard who adjusted/repaired these doors and they are like new!. Would greatly recommend their services. just a quick note to say how satisfied we were with your friendly and efficient service when you repaired our French doors. I was particularly impressed with the care you took to explain what was needed and the finished job is actually better than the original. I would definitely recommend your company. Excellent service, turned up on time great value for money compared to local competition. Nothing too much trouble very quick, clean, tidy and thorough and I would recommend to anyone and everyone. Highly recommend my door has never worked correctly since I purchased it. It’s perfect now thank you. Absolutely impeccable service, reliable, on time, gave me lots of safety tips would definitely have him back to do other jobs. I would highly recommend the Window Wizard. I had a problem with UPVC windows that would’nt close properly and a number of faulty handles. I did’nt want to go to the expense of having new replacement windows as this seemed such a drastic measure as the windows otherwise were fine. On phoning the Window Wizard I found his advice very useful. Fixing the problem was the focus and there were no hidden extras. A professional job, well done. We called David for a job that others had failed to do. We were very impressed with David’s professional approach, through explanation provided of work done, job excellently done. These are real customers, don’t take our word for it, you can believe what others say about us. Since our website went live in 2009 we have been receiving customer reviews through this website, yell.com and Google. All our reviews are genuine and posted as they are received. We are very proud of our positive reviews and are grateful to our customers for taking the time to write them.